: Rectangular build, proud, strong, but not heavy. : Clean, of medium size and well balanced. : Slightly domed seen from the front and from the side, the occipital protuberance scarcely perceptible. : Black with open nostrils. : Not too short, bridge of nose straight. : Dark brown, medium-sized, tranquil expression. : Set neither too high nor too low; should reach to the middle of the muzzle when pulled forward. : Rather long, strong, clean and without any dewlap. : Deep, with well-sprung ribs, but not barrel-shaped. The back ribs should be particularly well developed. : Set-on neither too high nor too low, rather thick, reaching approximately to the hocks. Carried rather low. : Legs straight and lean with strong bone. : Shoulder blade long and oblique, muscular. Tips not protruding over topline. : Oval in shape, well arched, preferably well-knit, well covered with hair between the toes. : Oval in shape, well arched, preferably close together, well covered with hair between the toes. Dewclaws acceptable, but not desirable. : Lean and broad, turned neither in nor out. Well angulated. : Light, covering ground, parallel. : Harsh, very dense and straight with dense undercoat. : White with black patches, tan shadings on head and legs and sometimes between the white and the black patches. 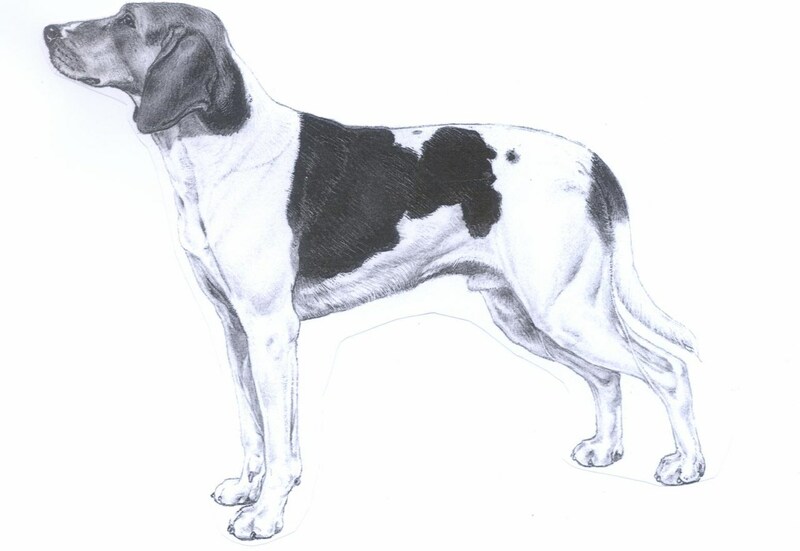 Black must not predominate, small black or tan spots are regarded as mismarked. Males 52-60 cm, ideal 56 cm. Females 50-58 cm, ideal 54 cm.